Recently, the First Department of the Appellate Division considered the question of whether the City of New York should be held liable for injuries which stemmed from an accident that the plaintiff argues was caused by the lack of a “stop here on red” sign and stop bar at the intersection where the accident occurred. The Appellate Division determined that the man’s claim against the city should move forward. The case, titled Chang v. City of New York, arose out of an accident in 2008 at a Park Avenue intersection. Kevin Chang, the plaintiff, was driving along Park Avenue near its intersection with E. 65th street. Chang, planning to turn left across the median of Park Avenue, stopped momentarily but rolled forward into the intersection. 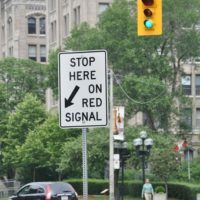 The City had determined all the way back in 1996 that the intersection needed both a “stop here on red” sign and a stop bar along Park Avenue where Chang was driving. While the sign and stop bar had been present at the intersection as of at most two months before the accident, they were not present on the day of the crash. After Chang entered the intersection, he was involved in a crash. Tragically, Chang’s girlfriend died in the collision. Chang filed suit against numerous parties, including the City of New York, for failing to maintain the “stop here on red” sign and stop bar. The City had succeeded in having Chang’s claims against it dismissed by the trial court, but Chang appealed to the First Department of the Appellate Division. The Appellate Division explained that the City had a “nondelegable duty” to maintain traffic controls. In other words, the City alone was responsible for ensuring that all stop signs and traffic signals are in good working order. The opinion noted that, while the City has discretion over where it installs signal lights, once those lights are installed, the City will be liable for any “failure properly to maintain an already established [traffic] control” if the failure to maintain was a cause in a crash. The Appellate Division pointed out that the result might be different, were the victim familiar with the intersection in question. In cases where the injured plaintiff had driven through the intersection when the missing stop sign or other warning signage had been present, then the court would consider that person to be aware of the potential dangers of not stopping there. In those cases, the plaintiff, rather than the City, would be liable for any resulting injuries. However, in cases where a stop sign or stop bar had once been present but had not been maintained, and the injured plaintiff has never driven through that intersection and was not aware of the need to stop or stop in a particular place, then the City bears the liability for those injuries. The Appellate Division reversed the trial court’s dismissal, allowing Chang’s claim against the City to move forward to trial. If you have been the victim of a car, bus, or train accident in New York, speak with an experienced personal injury lawyer about whether or not you may have a claim for damages against the responsible party, and contact New York accident attorney Leandros A. Vrionedes for a no-cost consultation on your case, in Manhattan at 212-889-9362, or in Astoria at 718-777-5895.